It all starts with having an organized approach. This year, I’m focused on scaling my marketing business — and one of my key strategies is getting in front of more people at industry events and conferences. If you’re reading this, it’s probably on your to-do list too. Although public speaking scares a lot of people, I really enjoy it! And I love how it gets you exposure and recognition as a thought leader, gives you access to new audiences, and helps you gain a longer-term following on social media…and sometimes even press. Here’s the catch: There’s a lot of competition out there. Each Call for Speakers is often met with hundreds of applications, and completing those applications can eat up your time and bandwidth. That means you need to make sure that you are choosing the right events to pitch to, and that you are doing it the right way. Think you should wait until you know everything about a topic before you get on stage on talk about it? Think again. 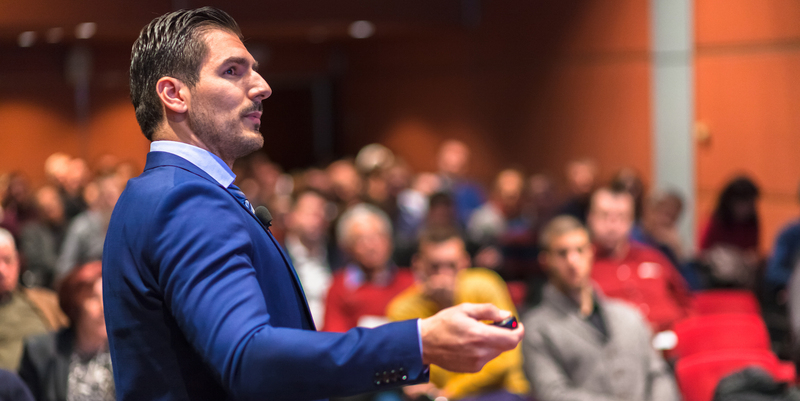 By presenting on a topic you’re knowledgeable about, you’ll be motivated to dive even deeper as you prepare to give a talk (and field questions from skeptics in the audience). “It’s one thing to build a tool or a concept and to think you know it. It’s very different to get up in front of people and to say: I understand that,” Keith says. And remember, it’s not all about you: Keith points out that while it’s tempting to put an idea into the context of your experience, you also want to think about framing it so your audience can relate as well. Once you’re excited about responding to a call for presenters (or CFP), what’s next? Securing speaking engagements, of course! There seem to be more thought leadership conferences seeking panelists and speakers every year, which means you’ve got to prioritize where to apply. I believe in delegating work whenever it makes sense, so I’ve charged my lovely intern with doing some research. For good measure, I’m also having her add the hashtags and Twitter handles for each. Meh, not a high priority, but interesting. Pass, unless they contact me directly. Of course, you can probably name the top events in your industry, no digging required. But as you research events (or delegate the process), there will be plenty of other options you aren’t familiar with yet. Lanyrd lets you see who attended each event, and gives you the previous year’s hashtag to scan what people were saying about it on social media. This is a wonderfully efficient way to get a snapshot of the mood of each conference, as well as popular topics of conversation. Yes, free food is always fun, but how do you know if speaking at a specific event will help you grow your business? It get you in front of an audience you’re interested in. For him, that includes potential software clients or future readers of his book, A Practical Approach to API Design. It’s the kind of event that gets people thinking differently about something or actually doing something differently. If you can offer a solution to a problem or offer a way to help people work better, you can become part of that story. You’ll want to build related tactics for success into your plan. For instance, Keith sometimes gives out coupon codes for his book at industry talks, or drives traffic to conference-specific landing pages. When it comes to getting press or social media coverage, that’s harder to plan for and track — but it can still be very valuable. If you want to standardize how you measure results, you can try tracking how many people shared or wrote about your talk. If you feel you can achieve either — or both — of these two goals by speaking at a conference and it fits your schedule, then applying to speak looks even better. If you’re not accustomed to speaking in front of a group at all, you may want to get your feet wet first. To get started, Keith says you don’t need to have given birth to your sector, but you do need to know something really well — at least, well enough to talk about it for a few minutes. At Keith’s Austin API Meetup, once a year members have the opportunity to deliver “lightning talks” of five to 15 minutes each. Investigate local opportunities to give short talks in your community like this, be part of a local panel, or even give a short talk in front of your colleagues. It can be helpful to have a low-risk way to share your story and to start getting exposure without needing to market yourself as an expert quite yet. How do you become known as an “expert,” anyway? I’d heard that your Klout score or the total number of your Twitter followers make that you’ll be more likely to get chosen, but Keith contends these are totally irrelevant. He explains that if you’ve spoken before, the event organizers might look at your Lanyrd or SpeakerRate profile. If you’re not there yet, you can include links to Meetups where you’ve spoken — a comment like “Wow, your talk was great!” can go a long way to validate you. Keith, a seasoned CFP applicant, still commits about a full hour for each application. After his initial Lanyrd investigation, he goes ahead and researches the themes for this year and brainstorms how they fit in with his knowledge base. Keith cautions that there’s a crucial difference, though: when you pitch to investors, they can ask you follow-up questions. But in a conference proposal, the organizers don’t have a chance to ask anything, so you have to make sure you’re crystal clear. If you’ll be going to That Conference, Summer Camp for Geeks, you’ll get to hear Keith give the keynote address. In any case, once you’ve got your strategies in place for giving your own talks, we’ll look forward to hearing you on stage as well! What are your tips for responding to a Call for Speakers? We want to hear them! Comment below or tweet them to @RedboothHQ and @JKRiggins!